SKOT is Serious, SKOT is Fun. Our shirts have two different designs, each has it’s own style. Everybody wears his shirt in his own way. All of our shirts are slim fit. The Fun shirts have sizes in Small, Medium, Large and X(X) Large. 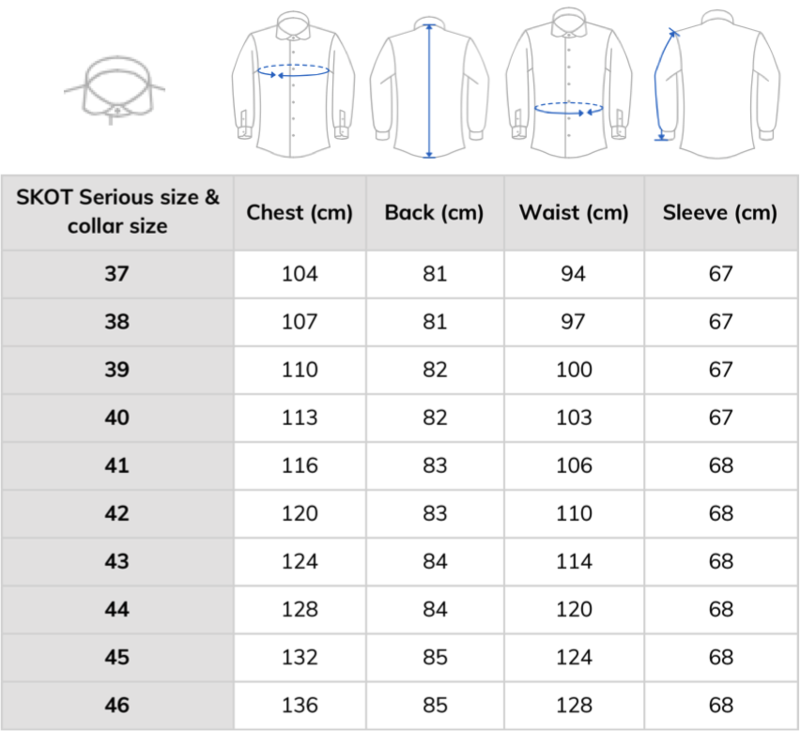 The Serious shirts have (collar) sizes from 37 to 46. Our T-shirts are slim fit. Because they contain 5% elastane, they will fall close around your body. Do you have a favorite shirt that fits you well? Check the size of it. Most Western brands have similar measurements. Do you usually wear regular fits, and do you need the extra space around your belly? 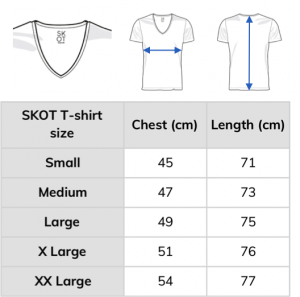 Add one size on the shirt, all SKOT shirts are slim fitted. Measure your collar size. In most occasions this will take you directly to the right fit. Are you lucky enough to nurture a beautiful round belly? Make sure to measure your waist. Add around 10 extra centimeters and check for the right SKOT size. No time for measuring? Is your fit non-average? Contact us, we are happy to help: hello@skotfashion.com. All SKOT shirts have their own unique fit, perfect for the modern man. The shirts have a slim fit, which means the waist is slightly smaller than regular. It will accentuate your body. The sleeve of the shirt is a bit longer than regular. Talking in sleeve lengths, the shirts are between size 6 and 7. The SKOT serious shirts have some extra length at the front and the back (3-5 cm). The SKOT fun shirts have a regular length. A shirt that fits well is all about the right proportions of the shirt. In Western countries the collar size determines the other measurements of the shirt. So measuring the size of your neck is the most important thing to do when you want to know your fit. The length in centimeters at the broadest point (around the Adams apple) is the same as the size index of formal shirts. They typically go from 37 to 46. This is also the case for SKOT serious shirts. If you, for example, have a collar size of 40, in most occasions the other measurements of the shirt will also apply for you. Everybody wears his shirt in its own way. Some people want to have an exactly fitting collar, because they wear their shirt with a tie. Others want a slim fitted shirt, to accentuate their body. 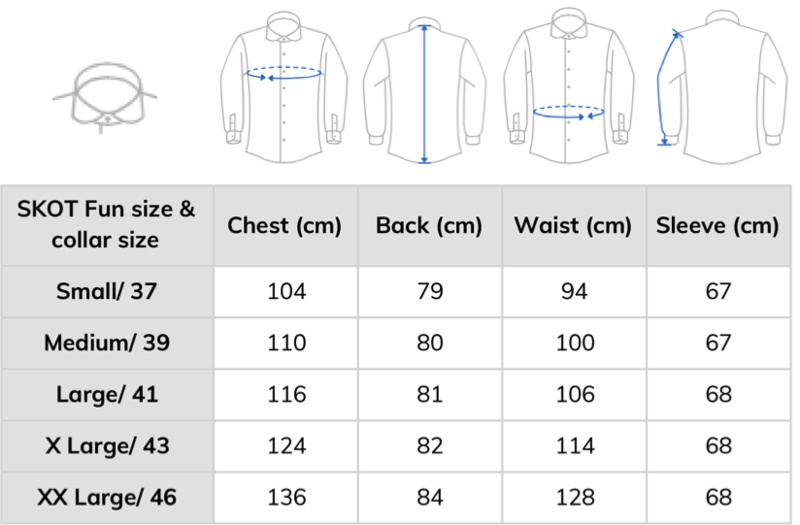 If you want to know sure if the size of your shirt suits your needs, measure yourself at the various given points and compare the results with the measurements in the size chart. Remember to add around 10 centimeters on your chest and waist measurement, to give the shirt (and yourself) some breathing space. Still unsure? No worries. We are happy to help. Send an email to hello@skotfashion.com. We respond within 24 hours.